Hello! I have my March Christmas Cards to show you today. I had fun making these cards! As most of you already know I play the Splitcoaststampers Christmas Card Challenge where we make Christmas Cards all year long so that were not stressed out during the busy holiday season. I make five cards a month so that I will have about sixty at the end of the year. I choose a different design each month, but I make five of that design. I also make long cards (4 1/4 by 8 1/4) so that I can fit a photo collage postcard inside and I try to keep my cards to no more than two layers and 'bump free', so they are easier to mail. Here is my Christmas Card this month. I made five of these cards. 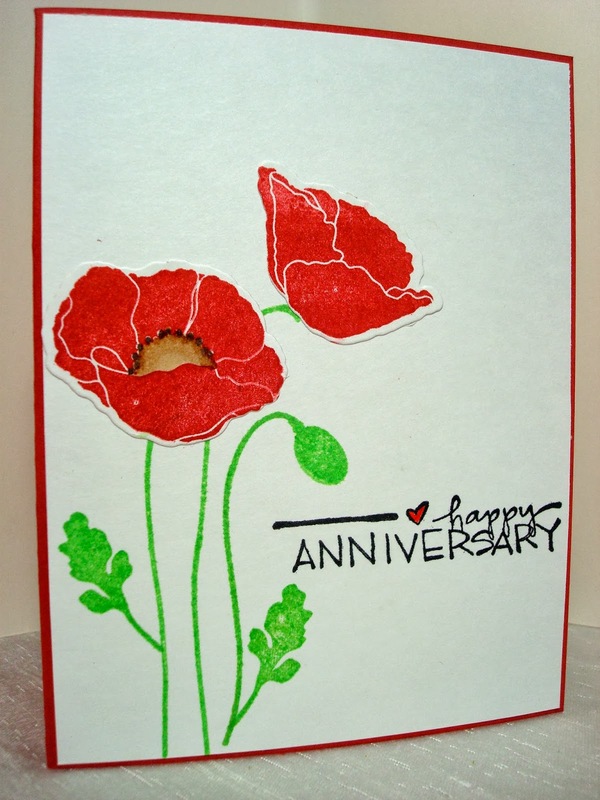 I used a retired Stampin Up! set called 'Winter Play' and stamped it on Kraft paper. My sentiment is computer generated. I colored the images with a mix of Copics and Prima Colored Pencils. I sponged the edges with white craft ink and sprinkled on a variety of glitters from Martha Stewart. 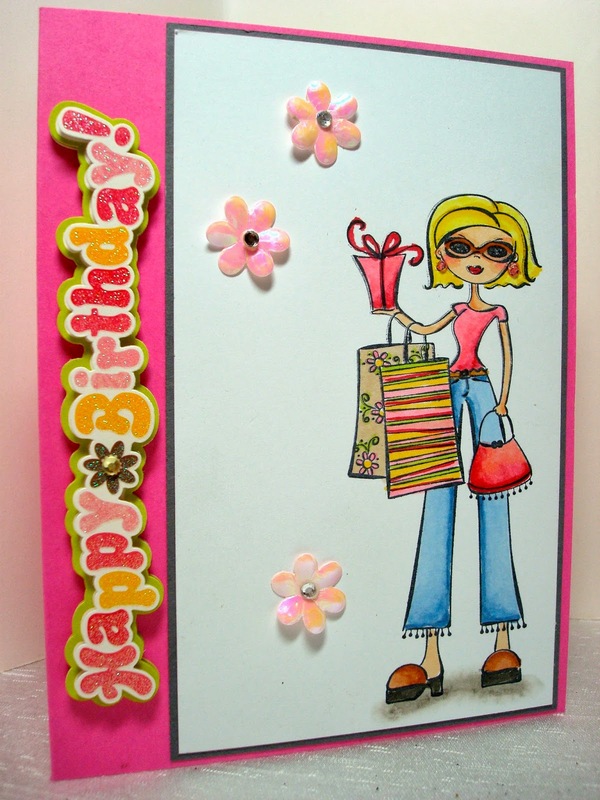 I finished with some shimmer spray and adhered the Kraft panel to a white card base. Here's some close ups for you! Hello! 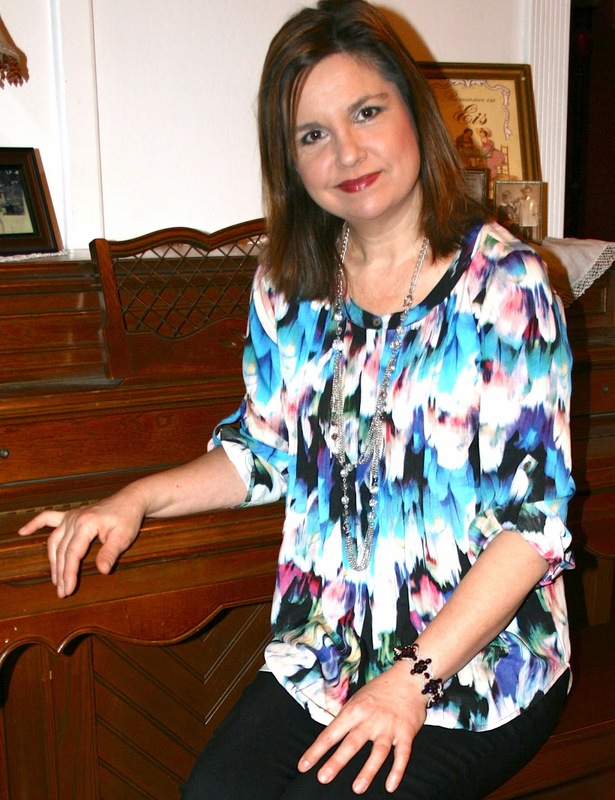 For this week's Fashion Over Fifty post, I'm playing with plaid. Oh, and if your still wondering why in the world I'm still showing winter outfits, it's because it is STILL cold here in Wisconsin. Trust me, I would love to show you some new spring outfits, but it was only about 9 degrees when I took this picture five days ago. I hear we are going to get one day in the fifties on Sunday, and then the temperatures will quickly plummet back into the thirties. So I fear if your looking for spring inspiration, you will have to look elsewhere. 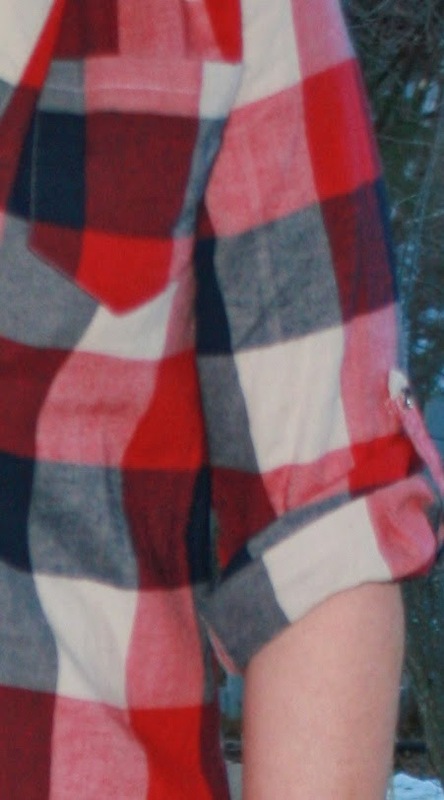 Anyway, back to the plaid. Plaid was all the rage this past fall and winter. I kept seeing it everywhere and resisted it. 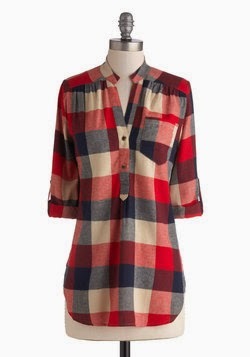 But when Bridgette Raes, one of my favorite style bloggers, did a post around this fun ModCloth plaid shirt I could resist no more. 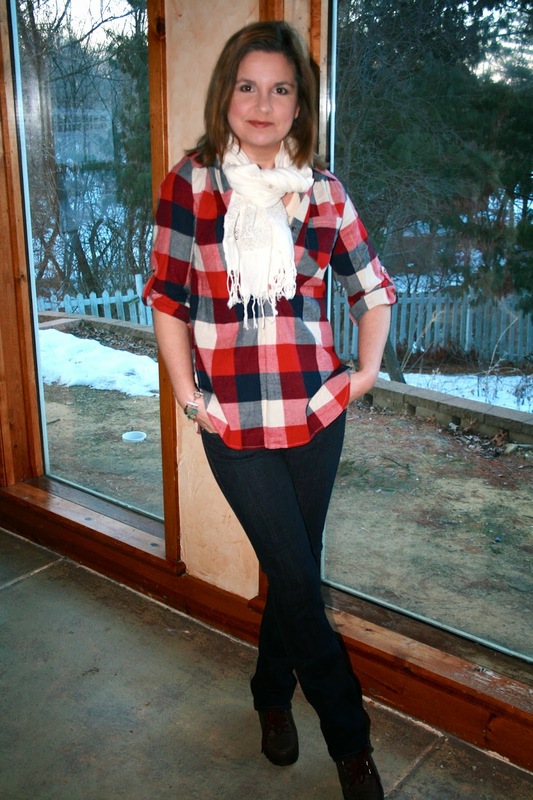 You really need to go check this post out and see how she styled this plaid shirt. She's amazing! 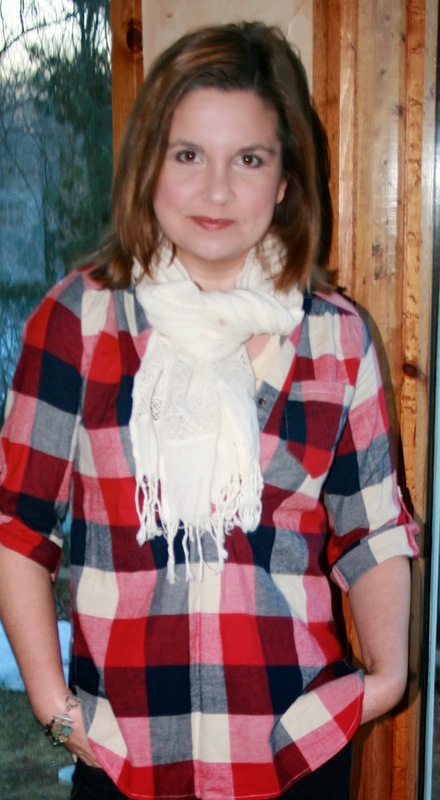 I had to have a plaid shirt after I saw all the different ways I could wear it. I used an off white scarf instead of a blue one, not only because I didn't have a blue one, but I thought a white one was at least a tad bit more 'spring-like' than a blue one. 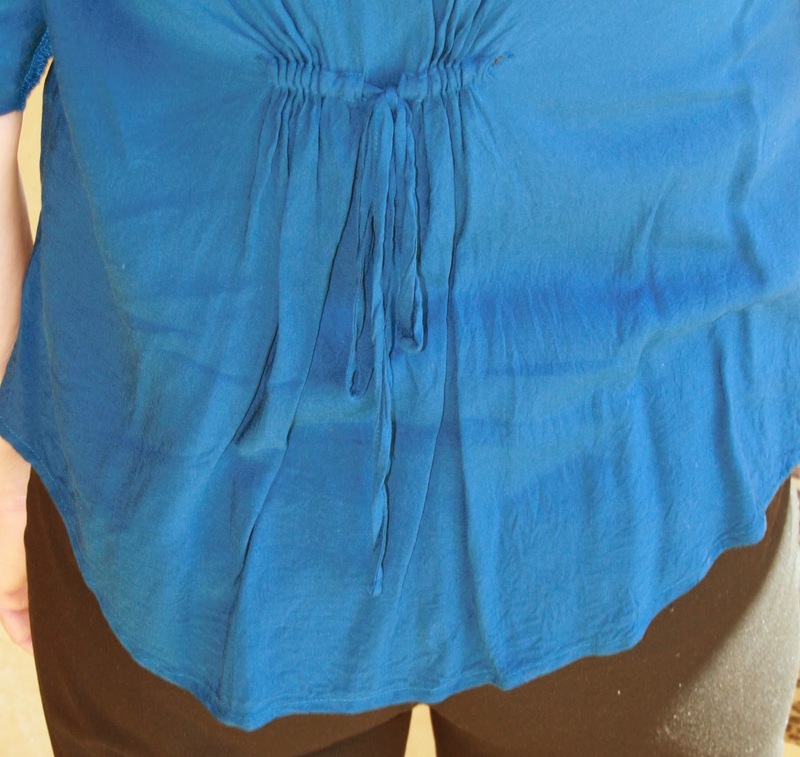 Because my scarf covers up my neckline, I wanted to show you a picture of the shirt as it appears on ModCloth. 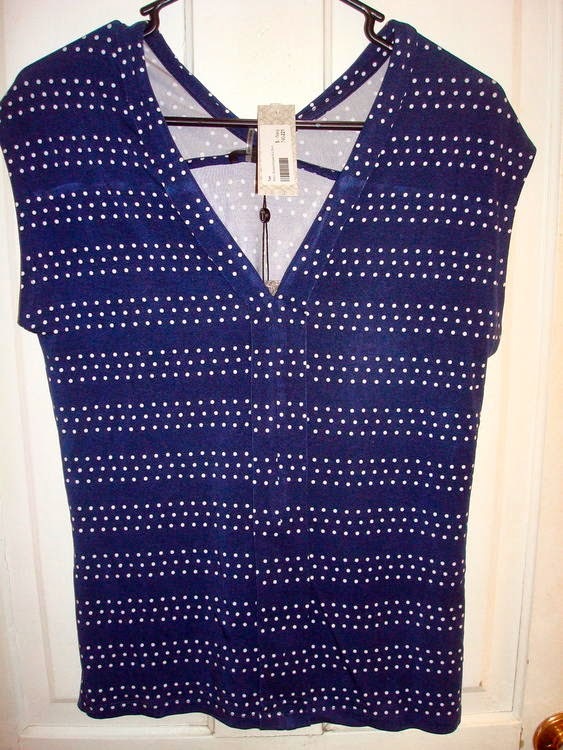 It has a deep neckline with buttons, one chest pocket, and sleeve tabs. A lot of previous buyers of this shirt described the material as thick, but I found it to be a very thin flannel, which I prefer. Because I carry all my extra weight on top, I do not like to wear bulky sweaters, sweatshirts, or tops for I feel they make me look even bigger. Here is a close up of the sleeve tabs, pocket, and plaid print. The shirt is very soft, and I love the length. I have a long torso, and many tops are too short for me. 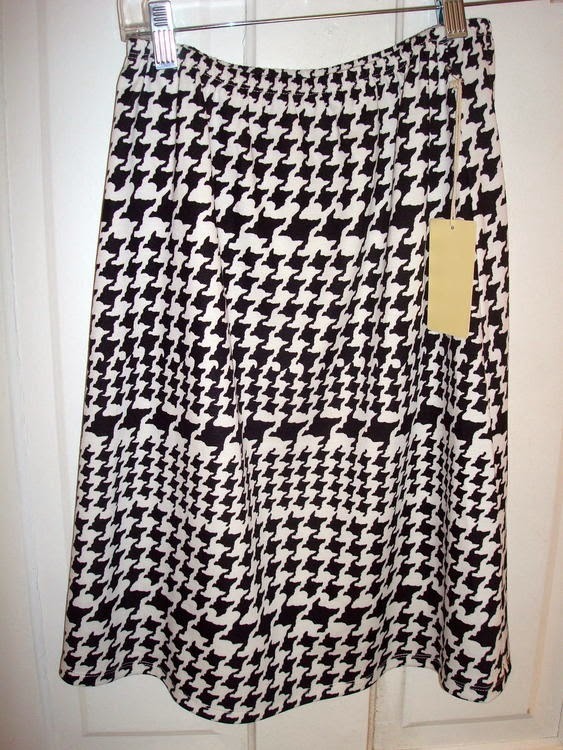 And because of it's length, I could probably wear this with leggings too. I purchased my scarf at Target. It has a nice long fringe and a beautiful lace inlet detail. For my bottom half, I wore a dark denim barely bootleg jean from Express. I can't even begin to tell you how hard it is to find a pair of jeans today WITHOUT holes. My friend and I were shopping yesterday and we were laughing at all the jeans with holes in them. We couldn't find hole-less jeans anywhere. I mean, really, I know it's 'in' right now, but if I wanted a new pair of jeans with holes in them, I'd just pull out an old pair from my closet that got holes in them the good old fashioned way: HARD WORK! Spend a few hours gardening kids, and you will have plenty of holes in your jeans. Because we still have plenty of ice and snow on the ground, I wore my old stand by leather dress shoes that have a nice heel to them, but plenty of rubber traction. The ice is actually getting worse instead of better because during the day it melts, and then overnight it freezes again, making it more slippery now than it was all winter. Oh, cold weather, please go away and stay away! And finally, because I have a scarf on and you can't see my neck, (and my long hair covers my ears, so what's the point of earrings? 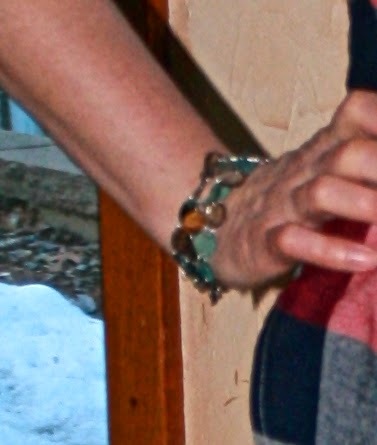 ), I wore a simple, multi colored bracelet from Lia Sophia. 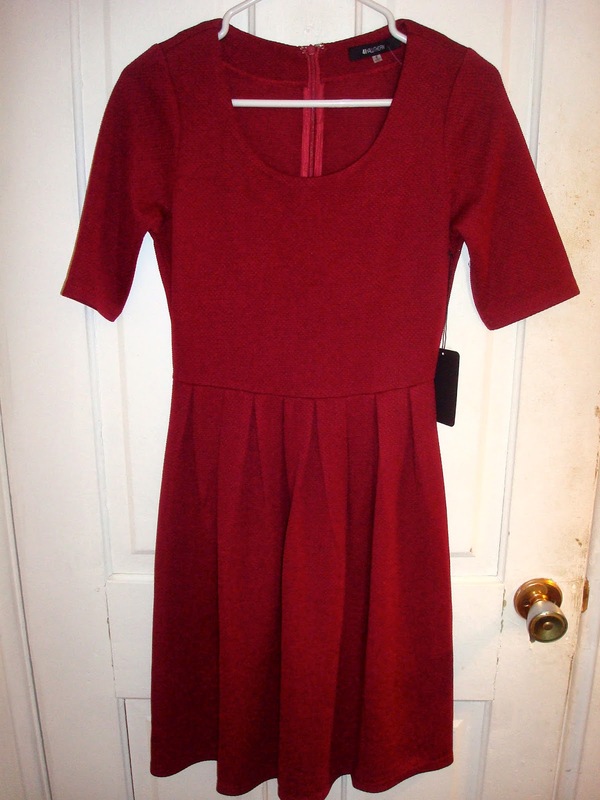 This was my first experience shopping with ModCloth and I really enjoyed it. What a fun company! Did you know that they have a customer style gallery where you can submit a picture of yourself wearing your new ModCloth clothes and they put it in their Style Gallery? You can even 'love' other customers style photos. Check out my style photo HERE. Another fun thing ModCloth does is to allow the customer help make the decision on what clothes the company will produce and sell. It's called 'Be the Buyer' where you can look at pictures of clothes being considered for production and vote for them. It is so fun! So what about you? Did you embrace the plaid trend this past season, or did you never stop wearing plaid and you always have a favorite flannel shirt hanging in your closet? There is something so comforting about flannel, and it seems the older the shirt gets, the softer and more comfortable it becomes. Hello! 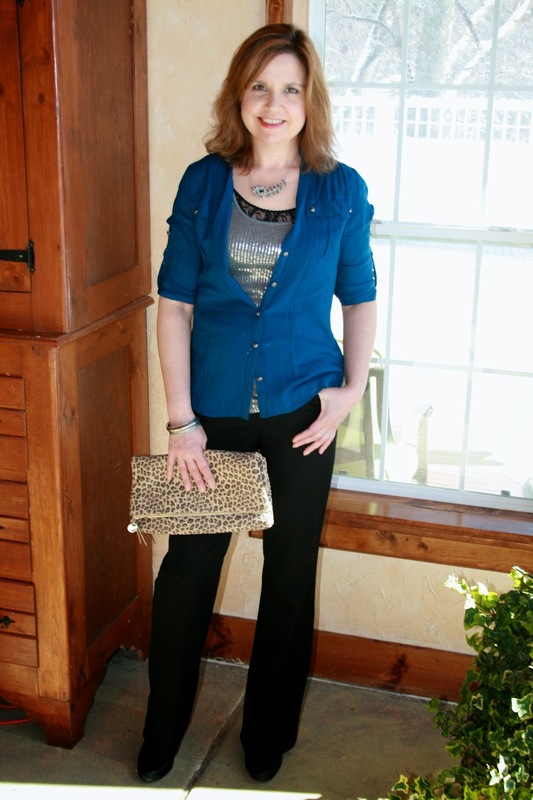 For this week's Fashion Over Fifty post I am going to discuss how to wear a monochromatic colored outfit. 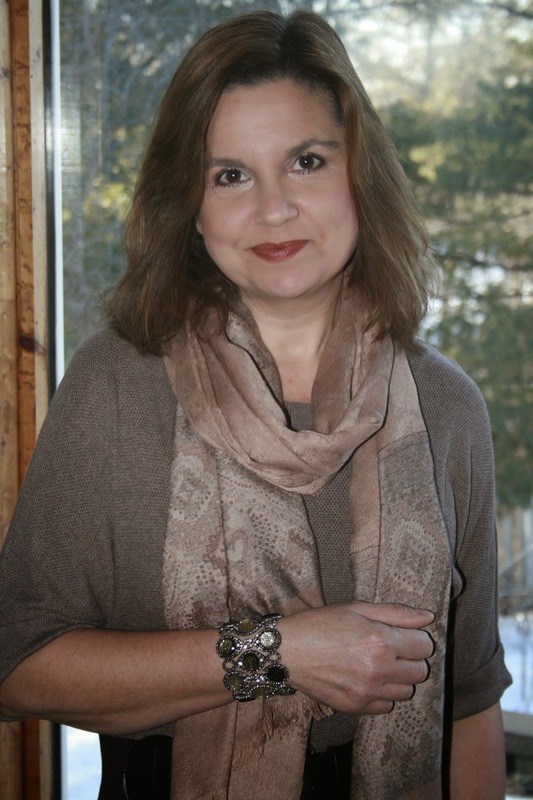 I know most of you are probably tired of seeing dark colors and winter outfits and are wondering when am I going to start showing some of this year's pretty spring trends, but even though the calendar says it is spring, in northern Wisconsin it is still winter. The temperatures were only in the twenties when this picture was taken, and it will only be in the twenties again this weekend. I am ready to scream; I want warm weather and sunshine so badly. I've already revolted in a small sense: I've packed away my parkas and knit scarves refusing, yes refusing, to wear them again no matter how cold it gets! I will only put on a spring coat from this day forward! And even though there is still snow on the ground, and my little tootsies froze the day I wore this outfit, I've officially declared that I'm done with boots and I will no longer wear them anymore this season too! So you see, even though it's not an official spring outfit, I've made a few, small, spring concessions in spite of the weather! LOL! Anyway, onto the outfit. My entire outfit is monochromatic in shades of browns. To keep monochromatic outfits from getting boring, just don't wear the same shade from head to toe. Yes, everything I have on is brown, but they are all different shades, textures, and even prints. There isn't anything in this outfit that is brand new, so I have no links to show you. My sweater dress was purchased last year from Express, the belt is off of another sweater dress I purchased from J.C.Penny (you can see that dress in THIS POST HERE), and the brown leggings are from Penny's too. The scarf is from T.J. Maxx, and the leopard print flats are from Target. So in a nutshell, this is a very inexpensive outfit that I have been able to wear for two seasons now. I wonder if this look will still be 'in' for a third year in a row. What do you think? 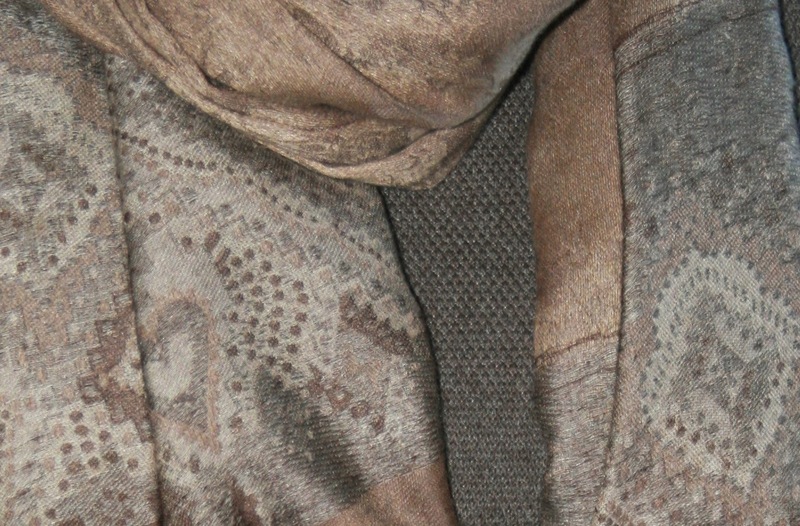 I love the subdued print of this scarf. It adds just enough interest, without being too busy and because of that I can easily mix it with other prints. It is so super soft and has a luxurious sheen also. My $14.99 leopard flats are always a 'go to' shoe for me. They go with so many different outfits, and always add so much interest. Here some close ups of my accessories. Accessorizing is so important when putting a monochromatic outfit together: you need to glam it up a bit to keep your outfit from being too boring. 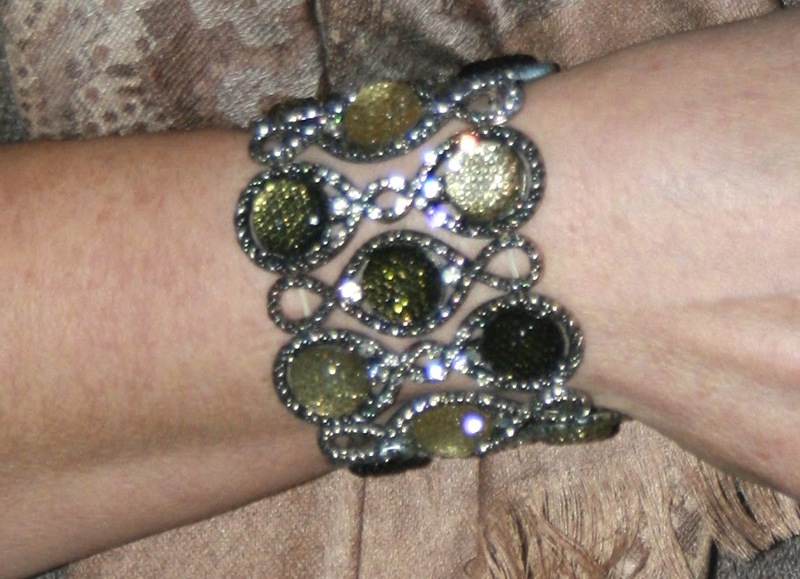 I love my bling, and this bracelet is one of favorites. I've shown it to you before in the same sweater post I linked above, but it's worth showing off again, it's so pretty. I love it when I find jewelry that I can wear with so many different outfits, and also wear year after year. Hello! I have just a very simple masculine card to show you today. I recently purchased this Inkadinkado 'Pocket Watch' stamps on accident. I thought it was a clearance stamp and I didn't realize I paid the regular sale price till it was too late. I decided to keep it rather than go through the hassle of a return because I figured it would make a really quick and easy masculine card; and it did! My first dilemma in using this stamp was how in the world do I color it? I mean, pocket watches are usually silver or gold, and the clock face either white or off white. Now I could have mimicked the look, but I felt it would be too much work and probably never look like I wanted it to anyway. So I decided to not color the watch and just stamp it on a piece of designer paper from DCWV 'Tattered Time'. 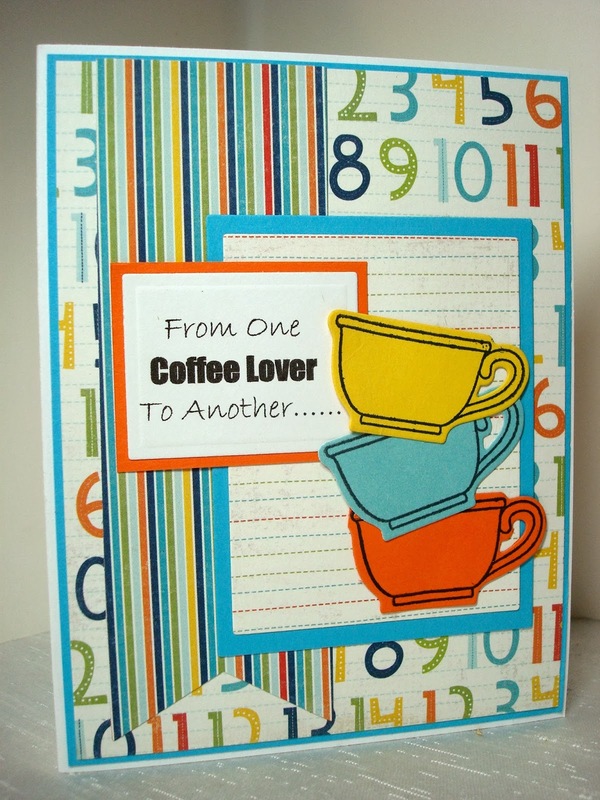 From there, I just added a sentiment from a retired Stampin Up! set called 'A Little Birdie Told Me' and adhered it to a Chocolate Chip panel, and a Kraft card base. That was it. I thought of adding either a string, or some brads, but I didn't. I liked it just as it was, and I figured, whatever guy I sent it to would prefer it unembellished as well. Hello! 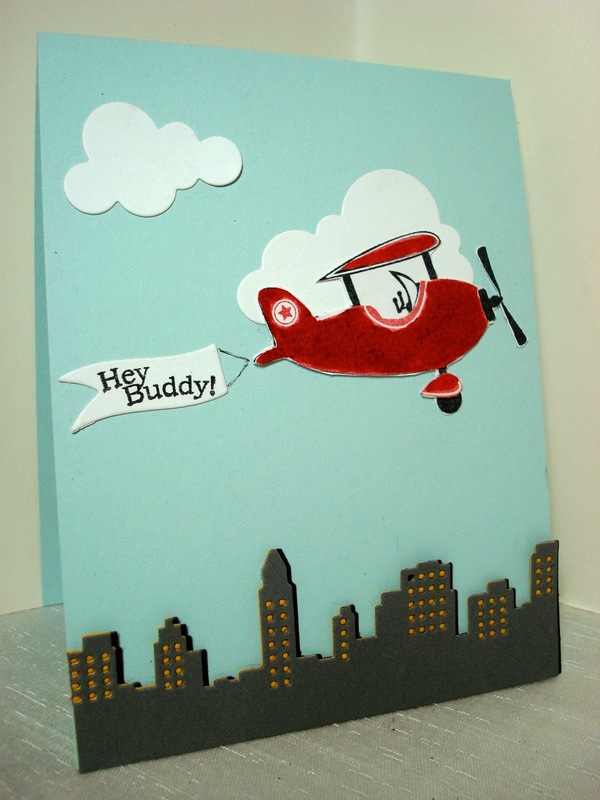 A lady at my church had knee replacement surgery this week, so I sent her this card to help her 'Feel Better'. My image is from PaperTrey Ink. 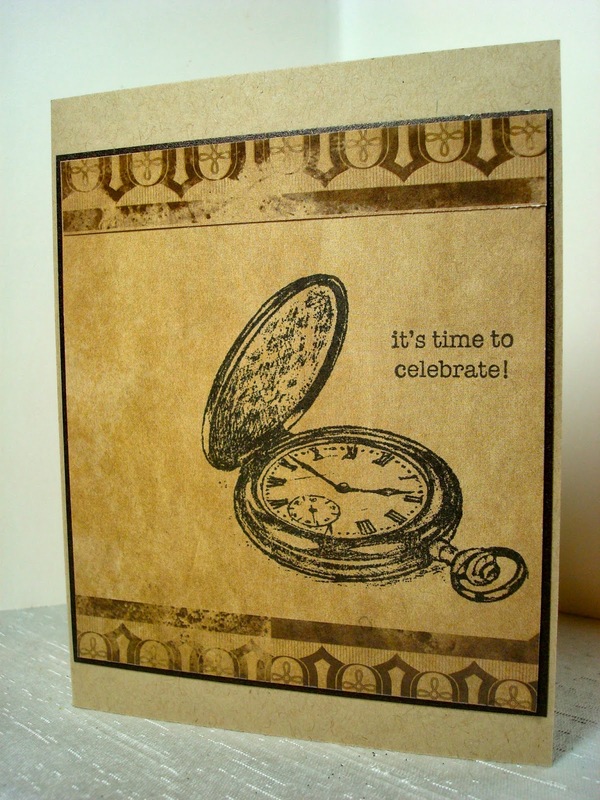 I stamped the outline image onto patterned paper and cut the image out with the coordinating die to the set. 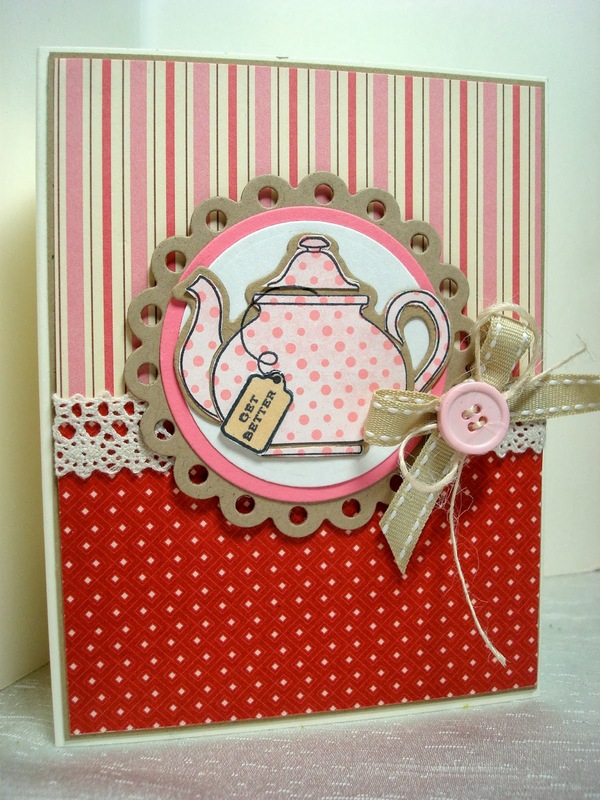 All the designer paper is very old retired Stampin Up!. Spellbinders Nestablilites were used to create all the various circle elements. Ribbon, crochet trim, a button and hemp are my embellishments. My coffee cup is actually a tea cup from a Papertrey Ink set. 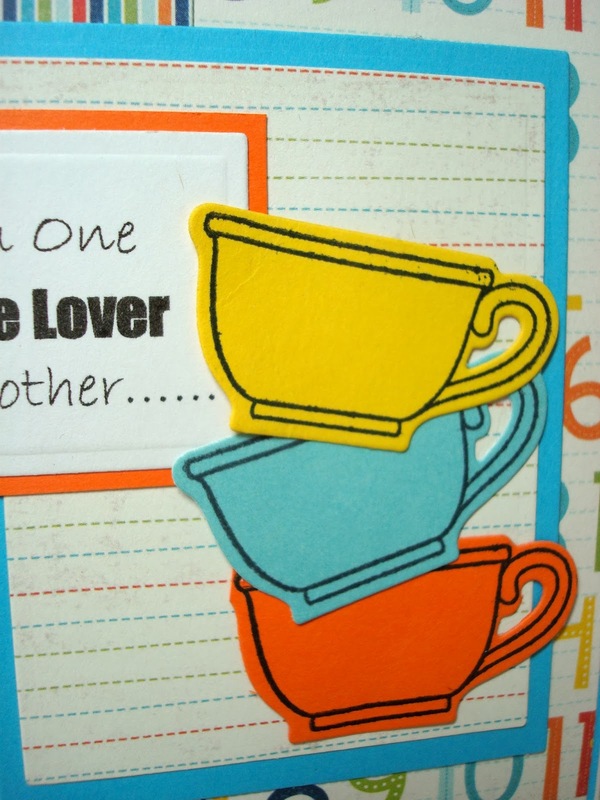 I just stamped the outline image onto brightly colored paper. The sentiment is computer generated. 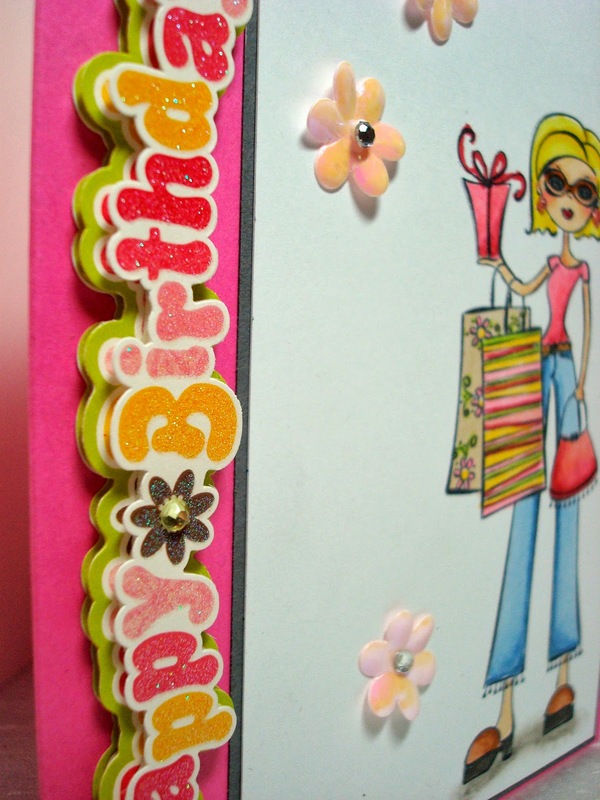 The designer paper is from DCWV 'Birthday Celebrations'. 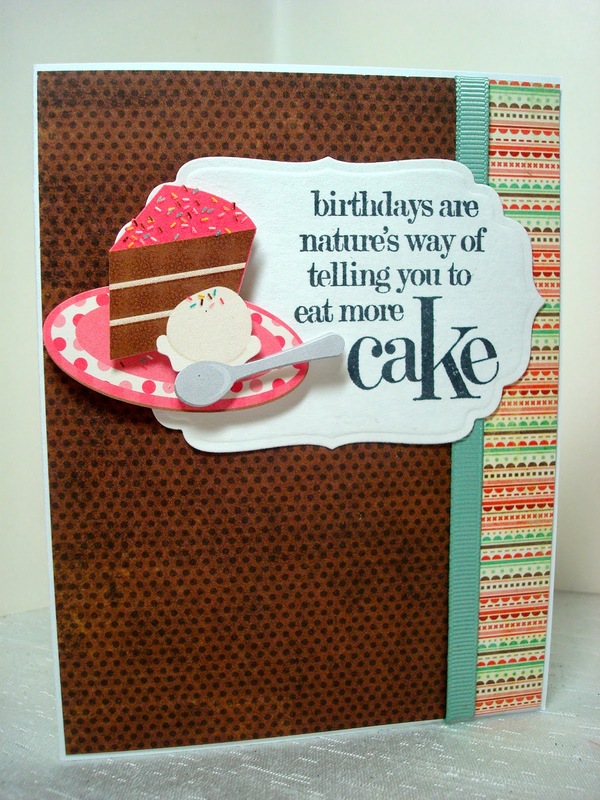 The inside of the card reads 'Happy Birthday'. Hello! 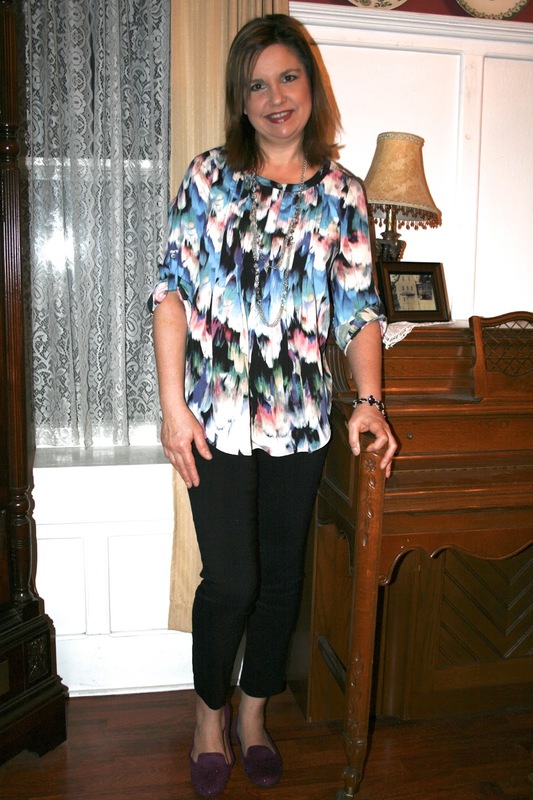 This week's Fashion Over Fifty post is all about how to take those basic items you might have in your wardrobe and dress them up a bit. You know you all have them hanging in your closet: the classic black pants that never go out of style and a standard button down shirt. Well I wanted to wear this old teal satiny shirt from Express but I felt it needed just a little 'oomph' than wearing it alone. So I added a sequin tank underneath with a black lace cami underneath that. 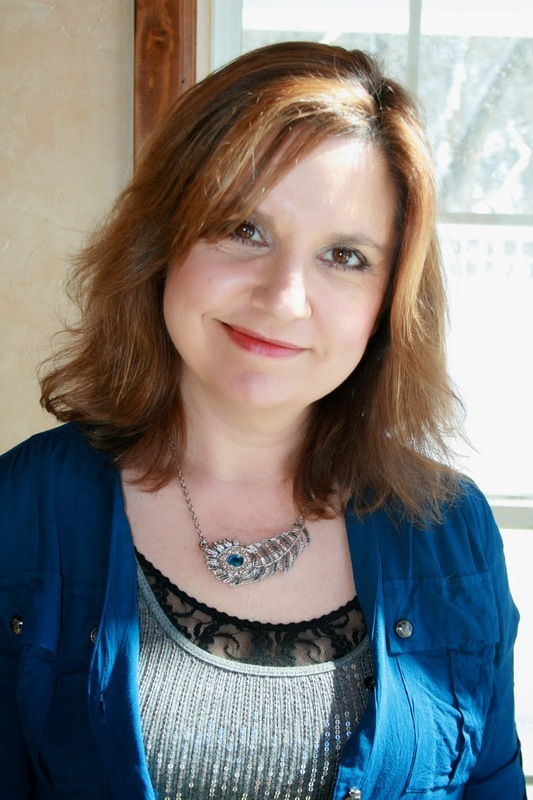 The sequin tank is kind of loose in my chest, that's why I added the lace cami. I also thought it brought a little more interest to the outfit than just the tank alone and the black color tied in with the black pants quite nicely. For jewelry I wore a silver peacock feather with a blue stone inside of it. The shirt has a nice little gathering and tie detail in the back. My only problem with this shirt, is I've washed it according to instructions and I've never been able to get the wrinkles out so it looks like new. Any ideas anyone? I might toss this shirt this spring if no one is able to offer any suggestions, because I've ironed it to death, and still can't get the wrinkles out. 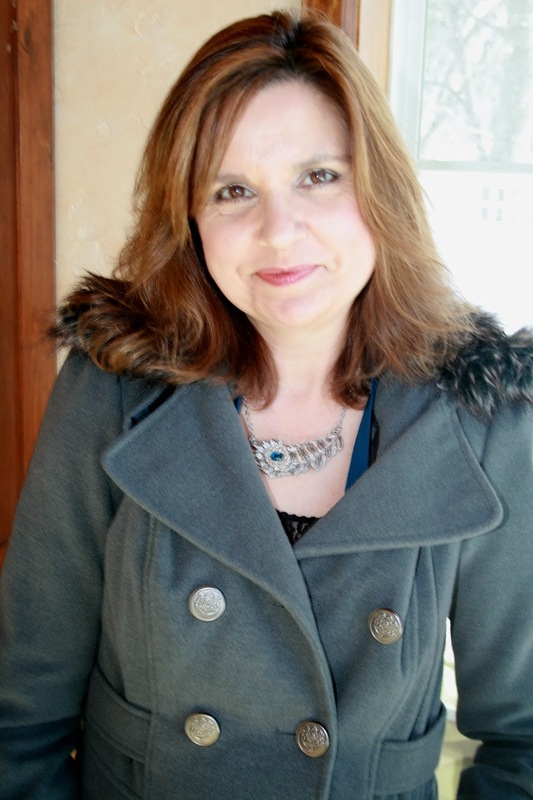 I wore a classic wool trench coat with a fur collar for my outwear and I carried a leopard print clutch. I have to show you the only designer clothing item I own: a pair of Michael Kors gloves. Aren't they beautiful? My daughter gave these to me for Christmas, and I actually CRIED when I opened the box and realized what they were. Can you believe that? I said, 'Oh my goodness, I can't believe I own something by Michael Kors!'. My tears weren't for shallow, materialistic reasons, but because not only did my daughter know me well enough to know what I would like, but she actually LISTENED to me. When Ashley and I were in Chicago this past fall, we saw a Michael Kors store and we looked at all his beautiful purses in the window (I was too timid to go inside, because I knew I could never afford anything ). I remember telling her that he was my absolutely favorite designer and I found everything he created to be a work a art; and even though I would probably never own anything he made in my lifetime, I still like to just look and admire his beautiful creations. Well she obviously was listening, because this was my gift. I will treasure them forever! I am one happy momma blessed with thoughtful, kind, generous, children.